Finally, the wait is over for DVD lovers! We are now on a very short list of distributors of this exciting DVD packaging product in the United States. 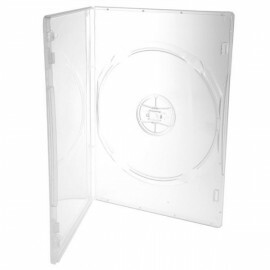 Introducing the brand new multi-10 DVD cases! Rare, superior quality and design for major DVD duplication and replication jobs. This fabulous looking 10-DVD case holds 10 DVDs! For home users, it simply enriches your prized DVD collections. For business users, it is a very cost effective means of packaging and shipping. When you mail DVDs out with this special case via the postal service, you can save yourself some postage fees. 7 7/16" (length) x 5 5/16" (width) x 1 7/16 (thickness)"
Min Order: 25 pieces, increments of 25.